This class consists of NISSHO MARU No. 5 only, completed in Mar ‘35 for Marusho Kaiun K.K. She was requisitioned by the IJN in Aug ’41 and converted in Sep ’41 to an auxiliary netlayer. 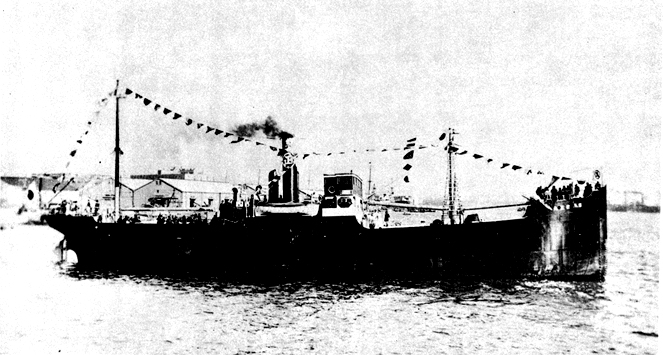 NISSHO MARU No. 5 was re-rated as an auxiliary transport in Oct ’43. She was bombed and sunk by US carrier-based aircraft in Mar ‘44. Builder and Year Completed: Osaka. Ohara Zosen Tekkosho K.K. Propulsion: One triple expansion reciprocating steam engine, one shaft, 490 bhp. Armament: As netlayer: (standard armament): One 8cm/40cal deck gun, one DC launcher, two DC racks, 24 DCs, two catching nets, one K type hydrophone.